Mahogany H-leg available with all tables. 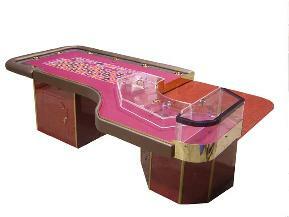 Roulette table with chip rail, drink holders, solid brass trim, bank cover and wheelcheck cover. This locking double base was made to the customers design. We refinish roulette wheels and usually have several available.